This is another of those delightfully quirky titles that Canongate continues to publish from time to time, and which shows that some major publishers of literary fiction have not entirely forgotten the adventurous spirit of their earlier days. Canongate is not too grown-up to delight in promoting the exotic, the eccentric, the capricious, the whimsical, and the compellingly curious. Nearly twenty years ago, Marías was involved in compiling an anthology of ‘very strange tales… in which each story was prefaced by a biographical note about its extremely obscure author’. So ‘ill-fated and forgotten’ were these authors that many readers believed that the editor had ‘simply invented it all… both the stories and the biographical notes’. The idea for his Written Lives arose from these earlier strange stories. ías writes in the face of that tradition, and in his opuscule offers alternative ‘appreciations’ of some of the (great) writers of the last two centuries. In so doing, Marías humanises his writers, portraying them as mortals, but in a light much more credible and much less flattering than their solemn disciples, devotees and fans would perhaps regard as proper. Marías’ original subjects – or victims – are a disparate lot: three Americans, three Irish, two Scots, two Russian, two French, one Pole, one Dane, one Italian, one German, one Czech, one Japanese, one Englishman from India, and one Englishman from England. In this slightly extended edition, Marías introduces six women writers: three English, two French and one ‘even said to have been born in Madrid’. (For some reason, not entirely clear, the Spanish Marías ‘feels rather inhibited about discussing writers’ from the country of his birth; so one must suppose that ‘the equestrian poetess’, Adah Isaacs Mencken, said to be born in Spain, does not quite qualify as Spanish, and only marginally as a writer. Her literary qualifications are entirely posthumous: her sole book of poems appeared the week after she died. And ‘most of her time she spent on stage, tied to a horse’. ías’ book is generally respectful. In all these essays, except the three already noted, the evidence that Marías has a genuine regard for his subjects is abundant. Although all the ‘brief lives’ are, in lexical terms, fleetingly short (in keeping in some ways with what the Psalmist famously writes) and none is longer than a handful of pages, they manage to over-flow in detail. Evidently minutely researched, each in its own way is erudite, but not futilely so. While Marías claims that ‘almost nothing in them is invented (that is, fictitious in origin), some episodes and anecdotes have been embellished’. This might pose, for some, problems in how to distinguish between what David Daiches once called the ‘apocryphally probable’ and the ‘probably apocryphal’. 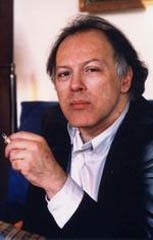 Conscientious in the extreme, Marías also provides a six-page bibliography that lists over 150 published sources, so readers, if they wished, do have the possibility of establishing for themselves the veracity or otherwise of what he writes. But to attempt to check painstakingly all the propounded ‘facts’ – most of which will undoubtedly be substantiated in the various sources – would destroy all the fun, and besides, Written Lives is simply not that kind of book. But ‘truth’ is not fungible. If all that is said about how the Brontë children were brought up is true, Marías argues, ‘then the sisters did very well in not turning to drink like their brother’. About that famous Polish writer, who became an Englishman, Marías cannily writes, ‘Conrad wore a monocle and disliked poetry. According to his wife, he only ever gave his approval to two books of verse, one by a young Frenchman whose name she could not recall and the other by his friend Arthur Symons’. Sublime. The juxtaposition of these details is absurd, yet it seems to be utterly in keeping with the life of Conrad, a ‘man of great irony’, but ‘an irony that his acquired English compatriots did not always catch, or which, perhaps, they did not understand’. 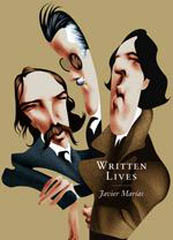 The two Scottish writers who feature in Written Lives are RLS, of course, and Arthur Conan Doyle. 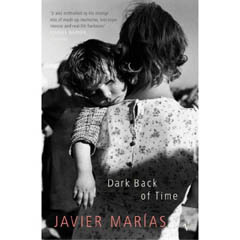 ías’ entertainingly anti-hagiographic approach doesn’t dethrone his writers – not that he ever set out to do so. Rather he presents them in a new light, and with an added dimension. I have the suspicion that their reputations will just about remain intact.